Video presentations have become popular due to their inherent capability to connect with the audience and to deliver a message efficiently. This is particularly important in life-saving topics like Occupational Safety and Health or Workplace Safety. Using SlideTalk as a PowerPoint to video converter, Human Resource managers can turn an average presentation into an interesting and engaging video. By adding background music they can make the video more intriguing. For workers with reading difficulties or conditions like dyslexia the automatic voice over from the videos eliminates the barrier provided by a text-only presentation. 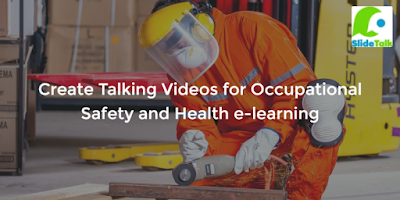 SlideTalk also supports more than 20 languages so a presentations can be turned into several videos with voice over in different languages to make sure that all employees can take part of the message and Workplace Safety instructions are received by all independently the linguistic background.